Eyelashes thicker and darker! In only a few weeks! Sparse eyelashes and eyebrows are now a thing of the past. Clinically Proven, Up to 64% Fuller Looking Lashes* Enjoy your longer, fuller, thicker and darker eyelashes in only a few weeks or your money back! You will be amazed by the incredible new volume and strength… sparse eyelashes and eyebrows are now a thing of the past. Clinically Proven, Up to 64% Fuller Looking Lashes* Enjoy your longer, fuller, thicker and darker eyelashes in only a few weeks or your money back! You will be amazed by the incredible new volume and strength… sparse eyelashes and eyebrows are now a thing of the past. Triple action CompleteLash combines the best lash accelerators with nano-peptides and botanicals for unmatched results*. You will have longer lashes or fuller eyebrows naturally! This breakthrough technology will give you amazing eyelashes and eyebrows! Its safe formula will help you improve your eyelashes and eyebrows in length, fullness, thickness and darkness in only 4 to 6 weeks, GUARANTEED! CompleteLash was formulated by physicians. It has been clinically tested and ophthalmology safety tested by an independent laboratory; proven to be a very safe and effective cosmetic lash accelerator. Stimulate Your Natural Eyelash & Eyebrow Potential Increases length, thickness and fullness with noticeable results in as little as 4 to 6 weeks. See dramatic results with your first tube. 96% of users declared itvery effective. 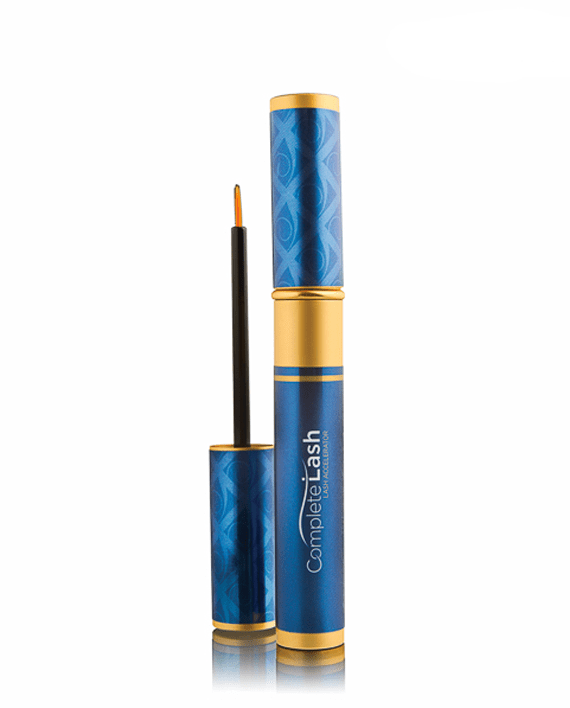 * 64% Longer & Thicker Lashes* CompleteLash utilizes new breakthrough technology. Special peptides, vitamins and botanicals condition and improve flexibility for fuller and thicker eyelashes and eyebrows. 64% Darker, Fuller & Stronger* CompleteLash high performance serum will prevent breakage of your lashes and help grow back eyelashes over time. This dye-free and paraben-free formula willmake all shades of eyelashes and brows darker while increasing fullness.